Does anyone have a good pun about Baklava? | I'm Gonna Cook That! Does anyone have a good pun about Baklava? Don’t die of shock, but for once, I cannot think of a food pun. Something about layers? I’m really trying to avoid the old, “It’s all Greek to me!” thing, but, well, I guess I just said it, didn’t I? Dang it! A few weeks ago I did the thing I do wayyyy too often where I volunteer to do something just because it sounds like fun and not because I actually have the time to really do it. Well, not do it and also get some sleep, anyway. But, once it was out of my mouth I was committed. I volunteered to cook lunch for my entire team at work. The lunch was on a Tuesday, and I couldn’t go grocery shopping until the Sunday before. Insert into that a full day at work and class all night on Monday, and what you get is a lot of middle of the night cooking. Thank goodness my roomie is a heavy sleeper because I was in the kitchen right after class on Monday putting together this baklava. That included pounding on a bag of pistachios with a big metal mallet. Good times, yeah? This recipe is a combination of this one, and this one. The first one calls for pistachios, which I thought was kind of neat and interesting and whatnot, and the other one, from Chef Michael Symon, actually includes cracker or bread crumbs. I took a little from each recipe and came up with this hybrid that turned out really tasty. 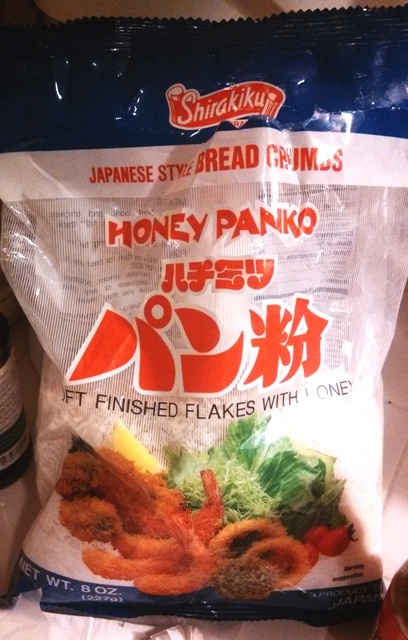 I still had this bag of honey panko from my trip to H Mart awhile back, so I used those for the bread crumb bit. If you can’t find that kind, or even panko, for that matter, just use regular plain bread crumbs. Or cookie crumbs. Or leave them out altogether. Once I give this recipe to you, it’s yours. Preheat the oven to 350. Butter your baking dish, pan, thing. At my local King Soopers, I found pistachios already shelled. I hope you do, too. I could only find the salted kind, but they actually added a nice little salty-sweet thing to the baklava that I found enjoyable. Anyhoots. Take those pre-shelled nuts and put them in your freezer bag and pound on them until they’re all broken up into little pieces. You’re not really going for pistachio dust, here, so don’t get too angry at them, just a little angry. 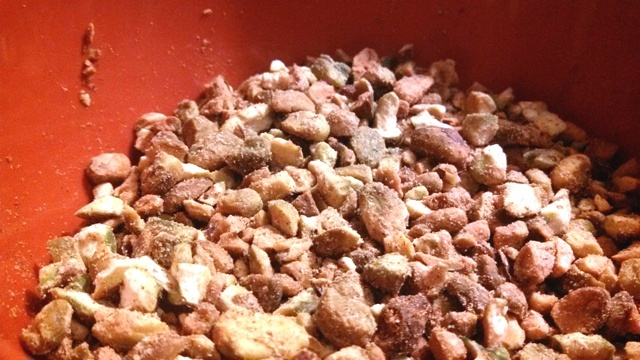 Mix the cinnamon into the crushed nuts. (Ha ha. Crushed nuts. Hi! I’m a 2nd grader!) Set aside. Melt your butter. Turn off the heat under the pot as soon as its melted. It’ll stay liquid long enough to make this dessert because you’re about to work FAST! Phyllo dough is infamously delicate. It’ll dry out if you don’t get it into the thing you’re using it for pretty quickly. Don’t stress yourself out over it, though. Just keep what you’re not using covered by that damp towel in between layers and you’ll be fine. Just think efficiently. Get all your other stuff for this prepped and ready to go before you open the phyllo. Put two sheets in the bottom of your pan. 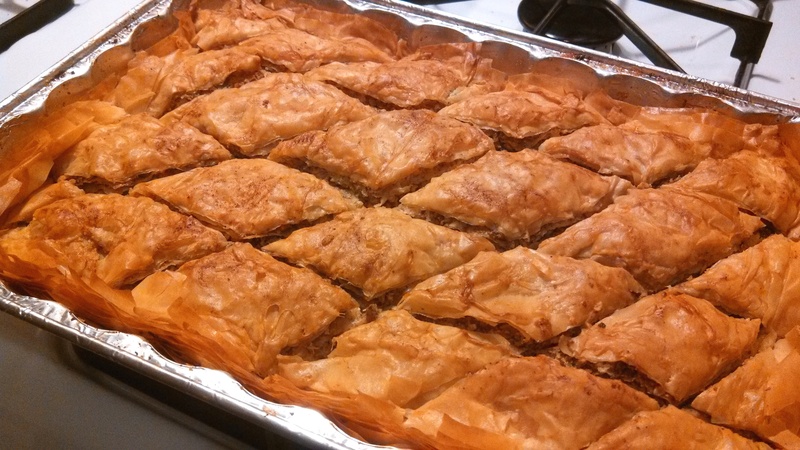 If you’re using the 9×11 pan, the phyllo will probably be just a little too long. You can trim the extra off, or just let it hang. I did. It was very late at night and absolutely zero f*cks were being given about that sort of thing. Brush the phyllo pretty liberally with some of the melted butter. If you don’t have a pastry brush, or a basting brush, just drizzle a couple of tablespoons of butter (maybe a little more if you think it needs it) onto the phyllo and swirl it around a little so there are no dry spots or sort of spread it around with the back of a spoon. 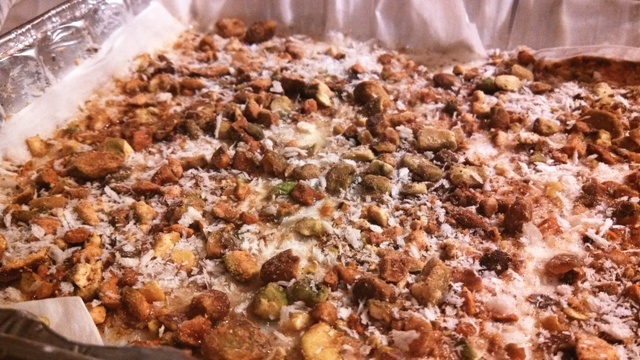 Sprinkle about three tablespoons of the pistachio-cinnamon mixture evenly over the phyllo. Then sprinkle a generous handful of your panko over that. Put three sheets of phyllo down over all that, butter it, sprinkle the nuts, sprinkle the panko, and then do it all over again. This can be as many layers as will fit the pan you’re using. I feel like I got maybe six layers into mine? Just go until you use the last of your nuts. 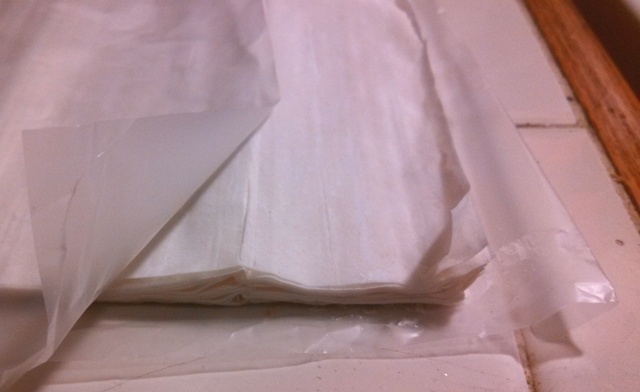 The last layer of phyllo, the one that goes on top, should be six sheets thick, but you’ll want to put down three, butter them, and then put down the other three. 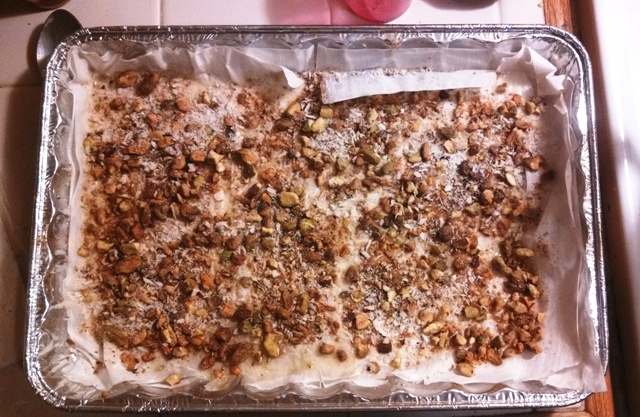 This is one of the few desserts that you actually want to cut before you bake it off. Make sure you have a pretty sharp knife, because you will need to slice through all those layers without tearing the phyllo. You do not have to cut it into diamond shapes. That’s just how it’s traditionally cut. You can do regular squares if you want. It will still taste delicious. The first link I gave you up there will explain how to do the diamond cuts if you want to do it that way. But really, squares are fine! I didn’t even really do these diamonds very well, but at this point in the process I was actually so tired the baklava started to look like a pillow and I had to try very hard to remember not to lay my head down on it. Into the oven it goes for about 35-50 minutes, depending on how many layers you get in there. Mine took about 35. While your baklava is baking, you can go wash out your butter pot to re-use to make the syrup. It’s important to have the syrup ready to go the moment the baklava comes out of the oven. It will soak in a lot better if the baklava is that just out of the oven kinda hot. Put 1 cup of sugar and 1 cup of water into your pot. Bring it to a boil, then add the honey and lemon zest and bring the heat down to low. Let it simmer for about 20 minutes, stirring occasionally. It’ll reduce a bit, but it won’t be too thick. Or, you know, just do like I did and take an impromptu nap while the baklava cooks and then scramble to start the syrup after it’s out of the oven. Let this be a cautionary tale, though. If you do it that way and then take said baklava on the bus, there is a strong likelihood of the syrup that has not soaked into the pastry getting all over the bottom of your Trader Joe’s bag. Just sayin’. You’re going to do it right, though. Because you’re going to bake this after having had a lovely 8 hours of sleep or more and ideally when the sun is out. 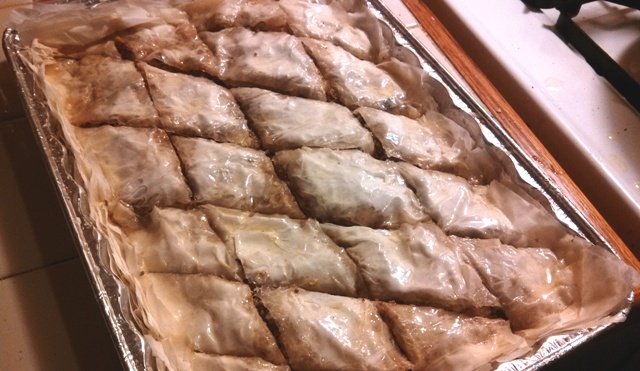 Once your baklava is all golden and flaky looking on top, take it out of the oven, pour the syrup over it, and then let it sit overnight, or until you wake up again, which might only be four hours later, but that’s OK. I must say, it was really effing delicious– buttery and flaky and nutty and just so many good things. This is a dessert with a lot of wow factor, but let’s be honest, is not that much effort. If you make it for people, they’ll probably be too busy stuffing their faces and telling you how good it is to even notice that you’re sleeping with your eyes open. ← On the Farm, Off the Hook! I thought of this pun yesterday, then found this article. Because that’s just how the Internet works. Q: What did the Greek pastry that enjoyed Baroque music call itself?